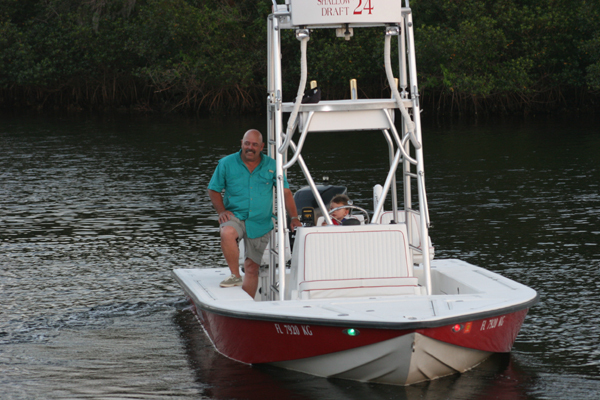 1982 Manatee 17ft Center Console on Galvanized Single-Axle Trailer, 1994 Nissan 90hp outboard. Boat is solid, ready to launch and has a clear title. No soft spots in floor and new non-skid installed on deck. Engine runs perfectly, comes with a 30 day warranty and has been completely serviced. ICom GP270-ML GPS and Hummingbird LCR4000 Fish Finder also included. Call Wayne or Kathleen (727) 942-8323. Or email to BOAT SALES for a complete picture package. HULL COMPLETELY REDONE FROM THE GROUND UP!!! 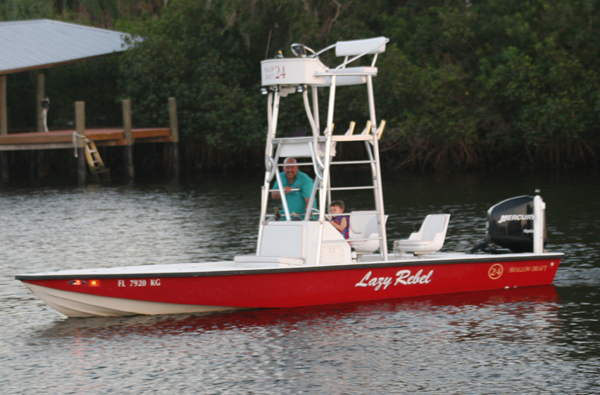 THIS BOAT IS THE ULTIMATE FLATS BOAT SETUP FOR THE SERIOUS FLATS FISHERMAN OR GUIDE. THIS IS A ROCK-SOLID HULL DESIGN, FLOATS IN 8 INCHES OF WATER IS SO STABLE IT DOESN'T LEAN EVEN WITH 2 PEOPLE STANDING ON THE GUNNEL. THIS IS THE IDEAL CUSTOM BUILT "ONE-OF-A-KIND" HULL THAT IS ESSENTIALLY BRAND NEW AT HALF THE PRICE OF A NEW ONE!!! 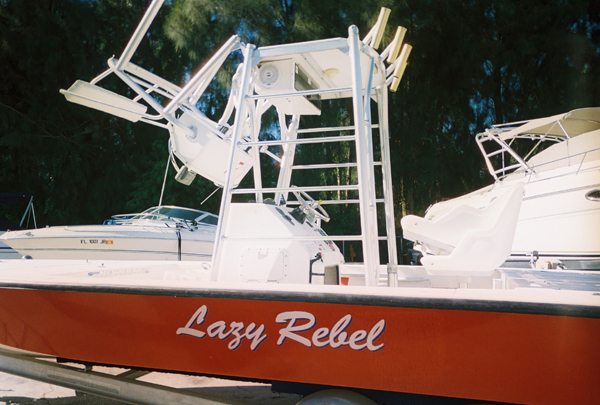 9' BEAM, CUSTOM BUILT ALUMINUM TANDEM TRAILER, 2000 MERCURY 225 OPTIMAX, STAINLESS STEEL PROP, 10' ALUMINUM HEAVY GAUGE FOLDING TOWER WITH DUAL STATIONS & ROCKET LAUNCHERS, BENNETT HYDRAULIC TRIM TABS, ELECTRONICS BOX, ON-BOARD BATTERY CHARGER, STEREO, DUAL STATION HYDRAULIC STEERING, 90 GALLON LIVEWELL WITH TWIN 1100 GPH PUMPS, TWIN FROZEN BAIT WELLS, DUAL 1500 GPH BILGE PUMPS, DUAL ROD LOCKERS, TONS OF STORAGE SPACE, DUAL BATTERIES W/ SWITCH, COMPASS. Hull interior was COMPLETELY re-done by Gause Built Boats in Tarpon Springs, Florida and all work done is documented - old stringers were completely ground out, an extra layer of glass was added to the entire bottom, new 4" X 8" heavy duty stringers (with "boxed" cross-sections and filled with high-density foam for added strength) were installed that run the whole length of the boat so they now come all the way up to make contact with the bottom of the deck - NO HULL FLEX!!!. 4" rigging tubes were installed front to back, fuel tank was cleaned while out of the boat as well then reinstalled with new tank sending unit and heavy duty 3/8" Ethanol resistant fuel line. All wiring and hoses under deck were also replaced with new. Deck was then re-installed, anchored to the stringers, new rub-rail was installed all the way around and the bottom received new Gelcoat. New upgrades include NEW Bob's Hydraulic Jack Plate (8" setback), NEW instruments in both top and bottom stations, NEW bilge pump, NEW twin livewell pumps, NEW navigation lights, NEW compass, NEW fuse panel and all NEW hoses & thru hull fittings. NEW trailer jack was also installed.